There can be no doubt ICT is changing the classroom. It facilitates a more learner centred approach to education. It helps pupils to associate learning with play. It frees up the teacher to spend more time with individual learners. However, it’s true what they say: the more things change, the more they stay the same. Here are some aspects of education that ICT hasn’t changed. In the beginning was the blackboard and chalk. Then came the white board and pen which was succeeded by the white board and projector and now this is being replaced by the interactive flat screen. Through the years these objects have served the same purpose: to focus pupils on what the class must learn. This pedagogical practice has survived through the generations. 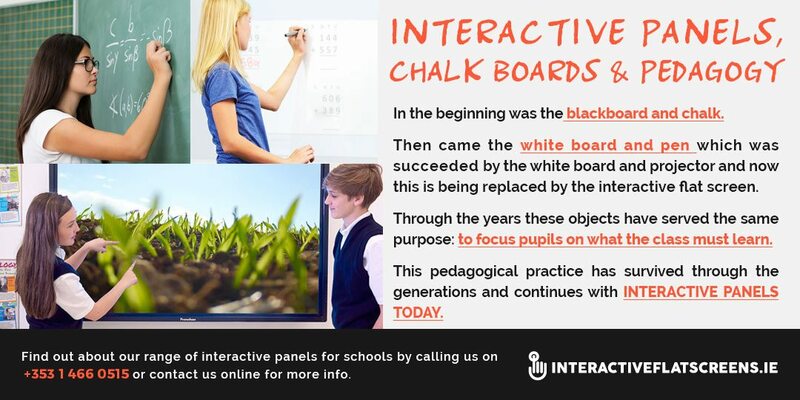 It is ironic that the thing many educators fear the most, the interactive panel, actually helps to preserve the pedagogical tradition. Once you learn how to use it you will find that it makes teaching easier without having to dumb down. The interplay of interactive panel with the pupils’ tablets allows for both the traditional and learner centred approaches to thrive in today’s classroom. Another thing that hasn’t changed is the educator’s authority. The interactive flat screen allows the teacher to assert his or her authority. By its size alone, it lets the pupils know who is in charge. It is just like a giant tablet or iPad and the biggest one in the classroom. 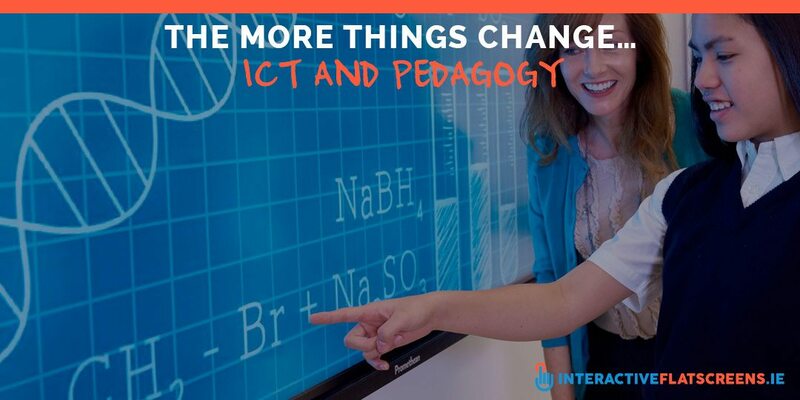 ICT in the classroom delivers instant access to information on pretty much any subject. However, pupils still ask questions, just like they always have. They need to see the bigger picture and the teacher can provide this. Also, there is so much information on the web that sometimes it is easier to just ask the teacher. Pedagogy emphasizes discipline in the classroom. Again, it is ironic that ICT actually helps to improve discipline and not break it down which is the root of many teachers fears. Because pupils become absorbed in interactive learning there is less class disruption. Problems with discipline often arise out of boredom. Interactive learning alleviates this. There are also things that pupils have traditionally enjoyed that ICT preserves. Watching a film is always a good treat for the pupils. The interactive panel provides an enhanced viewing experience. Because of its size and anti-glare technology, everyone gets a good view of it. The picture quality is also as good as any flat screen. As we have seen, ICT doesn’t necessarily mean change. It also helps to conserve traditional aspects of teaching. So, open your mind to it and you will find that it will facilitate your own personal approach, no matter what this approach is informed by. 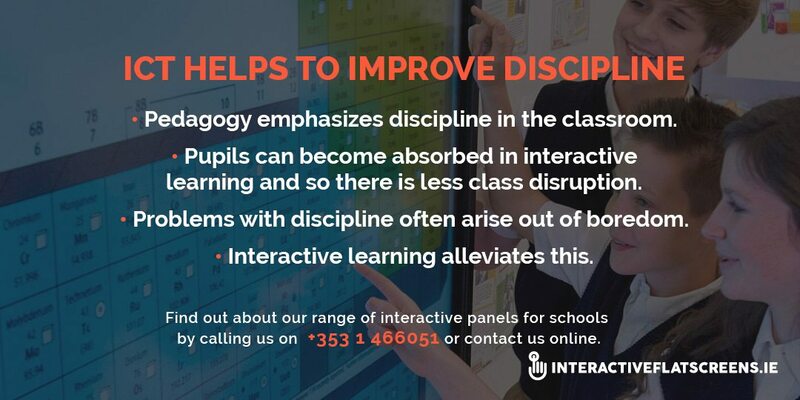 Find out about our range of interactive panels for schools by calling us on +353 1 466 0515 or contact us online now!